Demand for water is steadily increasing throughout the world and conflicting interests generate a complex and delicate field of work. Multi-purpose dams and dikes play a major role for water supply and flood protection. Often, these structures are old, rehabilitated over time and the knowledge on their actual safety and state of operation is limited. As a consequence many countries introduced new policies and legislation to improve dam safety and to secure water supply. The Netherlands are situated in a large delta area with many rivers and reservoirs regulated by a system of dams, dikes, locks and movable storm surge barriers to manage the water for irrigation, inland shipping, fishing, water supply and flood protection. Deltares has been intensively involved in this since the 1930s. Additionally, Deltares experts have built up worldwide experience on reservoirs and river catchments, e.g. in Australia, Azerbaijan, Brazil, Columbia, India, Singapore, USA and many other countries. 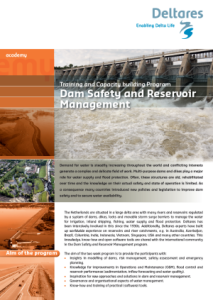 This knowledge, know-how and open software tools are shared with the international community in the Dam Safety and Reservoir Management program. The first week of the program will take place at Deltares in the Netherlands, including a site visit to a number of Dutch dams. The second week is held in Switzerland and Spain in cooperation with the Technical University of Lausanne and the Technical University of Valencia. This week includes 3 days of site visits. For more information and an outline of the program, click here. Early bird price per participant is: € 5,235.- when paid before January 31, 2019. Late registration price per participant is: € 5,758.- when paid before March 15, 2019. Organisation of the training course and support of the participants. Deltares experts and external experts that prepare and present/moderate the lectures, workshops, exercises, demonstrations and site visits. Board and lodging of the participants in middle class hotels, period May 12 – May 25. Travel Delft – Lausanne by coach bus. Travel Lausanne – Valencia by coach bus. 7 days transfer between the hotel of stay and location of training. 4 days travel by coach bus during site visits. Hand-out of all presentations on a USB stick. Use of Deltares facilities: class room, iD-Lab, software (D-Geo Stability, DAM (Dike strength Analysis Module), Delft3D and Delft-FEWS) and ICT. Deltares Academy Certificate of participation (when course has been completed). Please contact academy@deltares.nl if you are interested in participating. Download General Course Conditions Stichting Deltares. Please accept cookies to share this article.